This is the Priory Residents’ Committee’s proposal for the future management of the estate’s communal gardens and trees. It is based on an overall vision of retaining and, where possible, enhancing the original landscape and garden design that complemented the architecture of the estate in 1956. In the 1950s, the architect Eric Lyons set out to transform new housing in Britain through his philosophy of introducing high density, high quality Modernist architecture set in a designed landscape. The Priory was the first of many residential developments in Blackheath designed by Lyons and delivered through his development company Span. These are now universally recognised as amongst the finest post-war residential designs in England. The integration of architecture and landscape was fundamental to Lyons’s vision, and he considered his residential developments to be ‘housing as landscape architecture’. Lyons saw the communal gardens as having multiple uses and different character areas: from the more ‘public’ spaces in front of and between buildings to the more intimate spaces at the edges and behind. The general approach was to provide usable lawn spaces set amongst mature trees, separated by borders planted with a range of perennial bushes and ground cover. The form of the landscape reflected the English Garden---informal, asymmetrical and natural. Species varied, but were generally perennial bushes and ground cover arranged to provide different layers, textures and colours. An important consideration then and now was easy maintenance. The Priory reflects Lyons’s vision better than most of the Blackheath Span estates due to the topography of the site, the wealth of mature trees retained (or replanted) from the previous Victorian gardens, and the fact that the Priory as one of the very early Span developments was not affected by budget constraints that reduced the quality of later Span landscapes. The Priory also had the benefit of a landscape architect---Ivor Cunningham. The approach at the Priory was to design around the mature trees that were retained or later replanted from the previous Victorian garden. A good example of this can be seen in the way that the central garden flats 43 to 61 are consciously designed around a Maple tree. The trees were consciously kept free of competing growth so they appeared as strong vertical elements rising above the predominantly horizontal blocks and landscape. Lawns generally dominated in front and behind the buildings, with the central courtyard areas appearing more formal and manicured than the more private areas behind the buildings. Lawns were separated by border planting consisting of a variety of hardy perennial bushes and ground cover. Although the Priory’s original landscape design is still broadly legible, decades of largely unchecked growth, coupled with the invasion of self-seeded trees and bushes, have seriously eroded the character of some parts of the gardens. The central courtyard areas have recently been successfully restored, but many of the rear and perimeter areas of the gardens have become overgrown, unsightly and largely unusable. Much of what was designed as usable lawn spaces has disappeared beneath scrubby bush growth, much of it self-seeded. 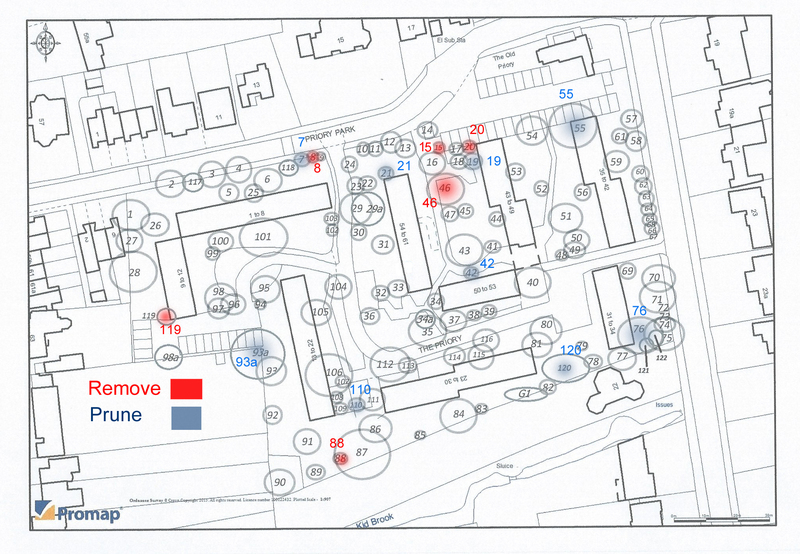 The Committee’s approach to restoring and maintaining the communal gardens of the Priory is shown in the following plans, and is based on the principle of re-instating a clearer definition between the principal elements of the gardens: trees, lawns and borders. To develop and improve areas that have become overgrown by Ivy, Snowberry and small self-seeded shrubs etc. around the estate in particular north and east facing elevations. Improve the estate perimeter especially on Priory Park to ensure public pathways are kept clear and to enhance the visual aspect of the estate. Specific focus on areas untouched for some years requiring trimming of trees, removal of small self-seeded trees, shrubs and ground-cover clearance. 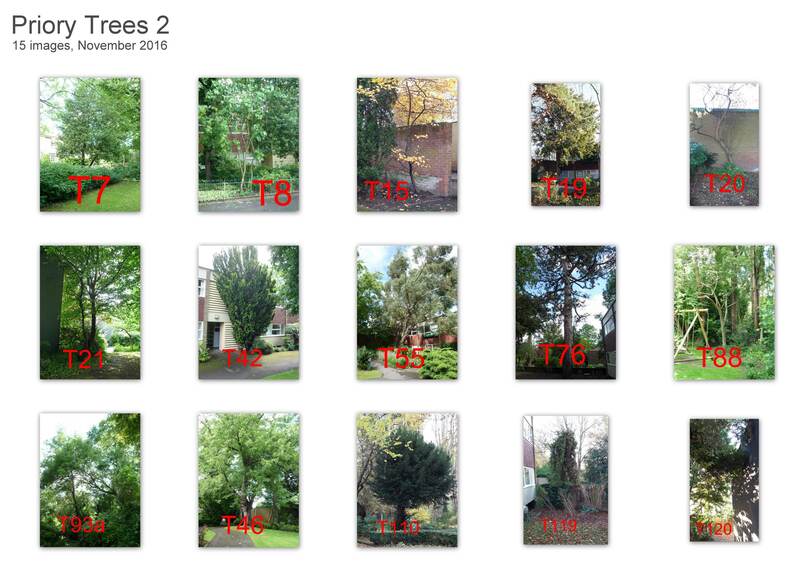 A tree survey conducted by Tree Craft identified 122 trees on the estate. Each tree was surveyed on the basis for the safety of residents, for potential damage to buildings, access for building maintenance, disease and general care. Following this survey a Tree Surveyor was engaged to review the Tree Craft survey. In addition Greenwich Council's Tree Officer confirmed what necessary action is required. The maintenance plan we will follow only considers Priority 2 requirements as confirmed by the Tree Officer. Outstanding issues and Priority 3 actions will be reassessed in the spring of 2017. Make trees safe to residents and buildings by removing dead wood, pruning or felling those trees identified as needing attention. Where practical create a 2 metre space around all buildings free from tree branches or significant shrubs to prevent damage to structures and permit access for maintenance, window cleaning etc. Pruning of tree foliage/branches will be undertaken to contain any potential conflict with buildings or services. Additional work to the back of area 2 flats 13 – 22. This area needs to be addressed as the border has encroached a lot. Suggest shrubs and bamboo are shaped with recessed areas between them to be created by cutting back Snowberry, brambles etc. and laying chipping or lawn. Making the approaches to The Priory more attractive. For example consider a beech hedge along the Priory Park boundary and then creating a space between the hedge and buildings ready for putting to lawn , wood-chip cover and small attractive shrubs. Detailed plans for all garden areas are attached and there will be an opportunity for residents to review them in the near future. Comments will be welcomed. Notice of those trees requiring work will be available at the review stage. Comments will be welcomed. But where a consensus of tree experts requires a tree to be removed we are obliged to follow their advice. During winter months leaf gathering, snowberry reduction, self-seeded saplings removed. Tree work to commence felling, removal of deadwood and trimming. Spring 2017 heavy pruning of overgrown areas and improve visual aspect of shrubs and beds. Cutting back and removal of plants around buildings to obtain 2m clear space. Spring into summer beds weeded, shrubs, maintained, lawns cut. For the current year there is a Gardening Budget of about £31,000 for garden maintenance, waste removal, path maintenance which includes a small contingency for emergency work. This budget is now fully committed; funding for the following year begins in September 2017. A budget allocation of £6,000 has been made for tree work. It is anticipated, due to the Tree Officer's input, some work recommended by the tree surgeons is not immediately required and there will be about £2500 available to progress the garden plan this year. Irrespective of potential additional work the proposed garden plan will be the basis for the regular maintenance programme and will be delivered over time. There are 4 aspects of proposed work which may benefit from this windfall and the Committee seeks the views of the residents about which should be priority.